In the event that you've shopped with Cartridge Save before then you'll probably already know that we're highly competitive when it comes to supplying Xerox 5500N toner. Every single purchase of this Xerox Phaser 5500N toner cartridge is totally covered by our renowned low price promise, ensuring that you spend as little as possible Cartridge Save supplies top quality toner for the Xerox Phaser 5500N printer which have been thoroughly put through their paces by industry experts to guarantee solid functioning. Cartridge Save will give you a, rock solid cash back guarantee on each Xerox Phaser 5500N toner so that you'll never need to accept a dysfunctional cartridge. Saving money is simple here at Cartridge Save because we provide free delivery on all Xerox Phaser 5500N toner cartridges. Customer care is our top priority, a fact underlined by the provision of a guarantee on all Xerox Phaser 5500N toner cartridges. Our award winning customer satisfaction staff will be more than happy to take care of your order all of the way. So place your order today. 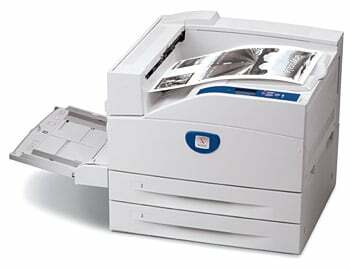 Workgroups in need of a robust and quick unit may opt for the Xerox Phaser 5500N. This monochrome laser printer is not just fast, it is also extremely reliable and can deliver high-quality output. Print resolution can go as high as 1,200 x 1,200 dpi and the reliable Phaser 5500N workgroup printer has a monthly duty cycle of 300,000 pages. This network-ready unit is integrated with a 500 MHz processor. The Xerox Phaser 5500N black and white laser printer does not come with an automatic duplexer. Print speed is quite impressive at 50 ppm. This monochrome laser printer has two 500-sheet trays and a 100-sheet multipurpose tray. The Xerox Phaser 5500N mono laser printer has a 128 MB memory but it can be upgraded to 512 MB. Users will have no trouble operating the black and white Xerox 5500N printer as it has a simple control panel with monochrome LCD display. The capacity of the black Phaser 5500N printer cartridge is approximately 30,000 pages. This workhorse can deliver crisp and professional images and text documents at quick speeds. The Xerox 5500N printer is very simple to use and it requires little maintenance and space. Workgroups will have no trouble sharing the unit as it has Ethernet connectivity and it is compatible with both Macintosh and Windows operating systems. The initial cost of the Xerox Phaser 5500N network laser printer is affordable and it has low cost of ownership, thanks to the separate toner and drum unit. The trouble with the Phaser 5500N is it lacks a standard duplexer for double-sided printing. More users would be able to access the Xerox 5500N laser printer if it had Wi-Fi connectivity.